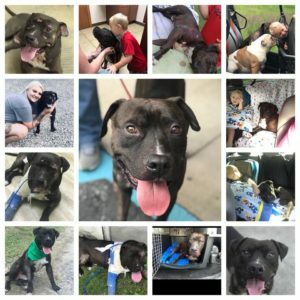 I’ll Miss You, Holt – A Reason to Believe Animal Rescue, Inc.
An Ode to Holt and fostering, written by his foster mom, Alissa Rife. Rescuing dogs has driven me insane but I’ve found my soul doing this, I think you just have to be born with a passion for this to do it. It isn’t for everyone and everyone shouldn’t do it. I’ve been at this for a little over a year now and I’ve probably had a million foster dogs LOL. I love each and every single dog that comes into my life. It took some time getting used to saying goodbye when they got rescue and it hurt badly at first I’m now used to it. I’ve had one goodbye I didn’t think I’d ever get over, but I did because she is loved. I’ve made a promise to myself. I don’t get attached because I can’t. Getting attached means another heartbreak when you have to say goodbye. These dogs stories draw me more than anything. So many are neglected and have never known love. Back in June, Jessica called me one night about a pit bull who had been chained to a guardrail and left by the people he thought he could trust. He was then hit by a vehicle and left to die. People saw it happened and pulled over to save him. They immediately reached out for rescue help. My favorite breed is a pit so I offered to foster him knowing we don’t take in pits often because we can’t place them due to so many already in need in shelters near our partner rescues. Holt has became a part of my family. He loves my son more than anything in this world. We’ve been there with him through every surgery he has had to have and all the pain he has had to feel. To our surprise he got an application in for a family in PA wanting to adopt him. Their application is very solid and good, so Saturday I’ll be taking him to meet his potential forever family. If it all goes well, I will have to say my goodbyes to him. My son Brayson doesn’t say much, but he sure does know how to call for his buddy “ olt.” We will miss him terribly and my heart is in a million pieces over this, but fostering isn’t about keeping them. It’s about caring for them and making them into pets for their new families. He needs this new home. They are so excited to meet him and we are so so happy for him. This is another hard, hard bittersweet goodbye I’ll have to say. Previous Post Three more dogs incoming! Thank you Alissa. Thank you for having a beautiful soul. Thank you for taking care of Holt and dogs like him.